There are so many different types of concrete work and varieties of ways to restore buildings with concrete that it can be hard to know which technique is best for your project. However, here at Concrete Renovations, we are industry experts with a wealth of experience. This means that after careful research and consideration, we will always ensure the right approach is taken to each individual concrete repair project based entirely on its own merits. However, at the same time, we think that it is important for our clients to understand the work we do. That way, you will be able to rest assured in the knowledge that we are taking the very best approach to your project. With Concrete Renovations, your concrete repairs are guaranteed to be in safe hands. We understand that every construction is different, and we adjust our methods to ensure the protection and preservation of all buildings, from your commercial property to historic Grade I and Grade II listed buildings. To start at the beginning, before you commence the concrete repairs themselves, you must make sure that everything is ready and prepare the applicable area for the work that is about to take place. One of the ways that we can do this is through a process called grit blasting. We offer grit blasting to prepare stone, concrete and masonry for the next stage of the restoration process. If necessary, we also provide grit blasting services to clean reinforced steel of rust, scaling or paint, prior to repair. What Exactly is Grit Blasting? Grit blasting - also known as abrasive blasting - is the process of propelling a concentrated stream of abrasive media onto a surface to smooth, shape, roughen, or remove surface contaminants. There are several variants to the process, each with their own individual set of benefits, making them suited to different projects respectively. Both the propellant and abrasive particles used can be changed depending on the work necessary, from relatively soft particles propelled by compressed air to sharp emery particles driven with high-pressure water or steam. 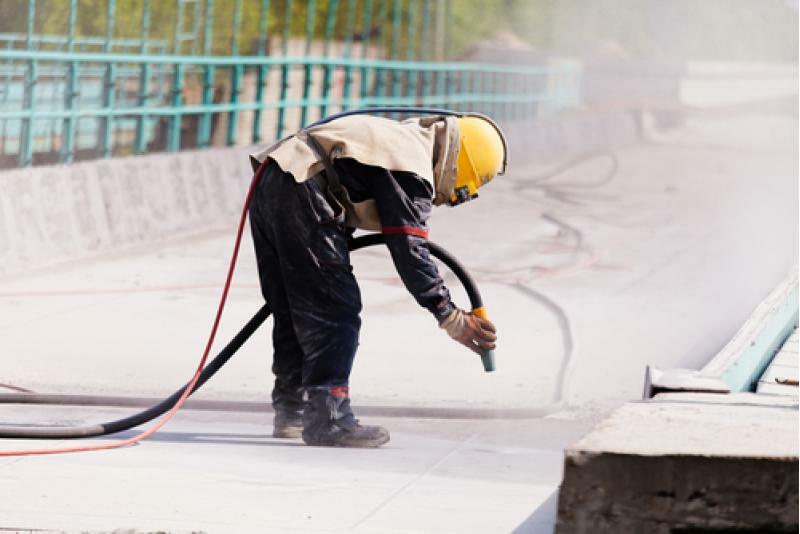 While grit blasting typically fell under the umbrella of sandblasting and blast cleaning to simply rejuvenate a tired-looking surface, it has become a necessity in recent practices. It can help to prepare surfaces for repair, clean surfaces for repainting or create an improved surface for the cohesion of adhesives. Originally developed as an alternative to sandblasting, wet abrasive blasting is a multi-purpose, fairly adaptable method of grit blasting. It allows you the freedom to use media ranging from coarse to super fine materials, including a variety of different densities. It can also be used to eliminate dust, so hazardous waste materials such as asbestos can be easily removed without any danger. This variation of grit blasting removes build-ups on the surface by driving small glass beads against the surface. It is highly useful as it removes unwanted build-ups but avoids damaging the actual surface underneath. This makes it ideal for cleaning pool tiles, grout, and vehicle bodywork, creating a smooth finish on machined parts and removing embedded fungus. This is one of the more common grit blasting variants. Like bead blasting, the original surface isn’t damaged during this process, however, no abrasive media is used during the hydro-blasting process. This makes it great for cleaning places that are difficult for some of the other methods to reach. This process directs a small stream of abrasive material to a specifically targeted area using nozzles that measure no more than 1.5mm in diameter to cover an area between 1mm² to 3cm² at maximum. Typically, micro-abrasive blasting, also fittingly known as “pencil blasting”, is used for smaller, delicate operations but can also be used to write on surfaces such as glass. This technique dislodges surface contaminants using frozen particles of carbon dioxide drumming against the surface at a high velocity. As dry ice is a softer material than sand, the process is preferred over sandblasting as it is less harmful to fragile surfaces and includes no abrasive media to impregnate the surface. It is useful as the dry ice leaves no residue, vastly speeding up the clean-up process. To find out more about the grit blasting methods we employ, give us a call on 01733 560362.